Artscrawl @ Wright's Indian Art: Albuquerque has (again) been named one of the top arts destinations in the country - this year #6 among large cities by American Style magazine. We know what a great arts city we have - it's exciting to see the rest of the nation catching on. one of Abq Jew's favorite galleries (and, not incidentally, a new Abq Jew advertiser). Now in its 104th consecutive year, Wright's Indian Art offers native American Indian jewelry, pottery, kachinas, fetishes, sculpture, Navajo and Zapotec rugs, Navajo folk art, masks, hot blown glass - and everything else individual Indian artists create. Wayne & Tania Bobrick, Owners. Sparkles of a Summer’s Night at Wright’s. 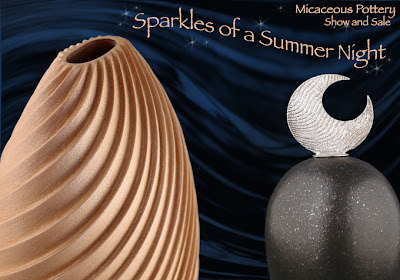 A glittering display of micaceous pottery by some of the most prestigious artists working in this scintillating medium: Alan E Lasiloo, Preston Duwyenie, Dominique Toya, for instance. Major award winners all, their work sparkles with serious creativity and skill. This evening only: 10% off all micaceous pottery. And don’t miss our month-long in-store special – selected pieces in all media, 40% off! Abq Jew reminds you that - it's summer! Shabbos starts late! Go out and Artscrawl! Jerusalem Online U Comes to Abq! Abq Jewish Trifecta! One Day Only! Last Call for Camp Oranim!